A festival highlight: Haaken Mjasset Johansen with Motif from Norway. All up, Ausjazz went to all or part of 15 MIJF gigs this year. This is an attempt to pick out some highlights, though there will be posts about individual concerts when time permits. A few explanatory notes: First, I chose not to review the Opening Gala: The Way You Look Tonight or the final evening’s Dee Dee Bridgewater Sings, because those concerts were not my cup of tea. That is not any reflection on the musicians involved. Second, for reasons beyond my control I could not make any gigs from Monday, June 4 to Wednesday, June 6 inclusive. Again, that had nothing to do with the calibre of the music on offer. Third, I did not make it to any of the master classes, though I have heard from many who did that these were definite highlights. Of the concerts I attended, there were none that I did not enjoy — perhaps I am easily pleased, but I believe this festival followed the usual rule by delivering more delights than may have been anticipated upon first glance at the program. It was not too adventurous — certainly not as “out there” as recent years under the direction of Sophie Brous. I did miss that aspect. The most experimental outings were Peter Knight‘s Fish Boast of Fishing and Andrea Keller‘s work with Genevieve Lacey and Joe Talia — both at the Melbourne Recital Centre’s Salon and both involving Australian artists. From overseas, the Robert Glasper Experiment strayed from the conventional, as did the Norwegian quintet Motif, but the latter was the standout of these two for me. Before I discuss highlights, it’s probably worth exploring the value or otherwise of reviews. Unlike reviews of opening night stage productions, with MIJF commentary there is in most cases no season ahead in which potential punters can decide to go or not go on the basis of what’s written. Most concerts are unrepeated or already sold out before reviews hit the airwaves, streets or online haunts. I see reviews as one way to build an archive or record of what a festival has succeeded in delivering. That record may provide some context to those who attended various concerts or merely arouse the interest of readers who may seek out that music in some form later, possibly even live if the artist or band returns. So, in consecutive order by date rather than any (futile) rating, my highlights were as follows: I found Bernie McGann‘s quartet at Bennetts Lane on the opening Friday night deeply satisfying, not only because of McGann’s saxophone work, but because of what the other players in the band — Marc Hannaford, Phillip Rex and Dave Beck — contributed. On the following night, at the same venue, Murphy’s Law impressed with Tamara Murphy‘s suite “Big Creatures Little Creatures”. At The Forum later that evening, the Jazzgroove Mothership Orchestra showed its class with visiting saxophonist Chris Potter, but the standouts for me were the Andy Fiddes composition Gathering Momentum, some trumpet excellence from Phil Slater in the third piece (the name of which I did not catch) and Potter’s darker sax in the encore Rumination. Later still, back at Bennetts Lane, the Eli Degibri Quartet from Israel had a smooth fluidity and swing that definitely had me wanting more, especially from the 16-year-old pianist Gadi Lehavri. What can I say about McCoy Tyner‘s concert on Sunday in the Melbourne Town Hall? The only basis I have for comparing the pianist now with his illustrious past playing is via recordings, and on that basis he is not quite in that league now. And I think Jose James could not act as a substitute for Johnny Hartman. I enjoyed the outing, and I don’t see much point in comparisons when you have a chance to hear a musician of Tyner’s stature. But this was not a festival highlight for me. By contrast, Terence Blanchard‘s quintet on Thursday at Melbourne Recital Centre was a real standout. It’s definitely no criticism of Rob Burke, Tony Gould, Tony Floyd and Nick Haywood, who opened this gig, but I did think as Blanchard’s band opened with Derrick’s Choice that a band with a local trumpeter such as Scott Tinkler or Phil Slater would have been ideal. In the quintet’s set I would have been satisfied just to hear Fabian Almazan‘s contribution on piano, but Blanchard’s playing was inventive, fluid and piercingly penetrating, with sampled audio from Dr Cornel West and some echo among the special effects. Blanchard’s tone did not really dig into the guttural until shortly before the inevitable encore and his sound was not as fat as I’d expected. Brice Winston on tenor sax was superb in the Almazan piece Pet Step Sitter’s Theme. In terms of musicianship, Renaud Garcia-Fons on bass with the Arcoluz Trio at the MRC on Friday night stood out. I’d regretted having to miss the solo bass gig at Bennetts Lane mid week, but in a way this trio concert was a vehicle for Garcia-Fons to show his amazing talents. On his five-stringed instrument Garcia-Fons uses a range of techniques with and without bow, recalling Barre Phillips‘ solo performance at Wangaratta Jazz last year, but it’s a totally different experience. I could only marvel at Garcia-Fons’s skill, but, by contrast with Phillips, his music lacked the tension and resolution (or lack of it) that is so compelling in jazz improvisation. Also, I would have liked to hear more from Kiko Rulz on flamenco guitar, who in brief bursts only whetted my appetite to hear more. I could not help but wish that Pascal Rollando on percussion would contribute more fire and inventiveness. That said, this concert was a highlight. Even more so was Dr Lonnie Smith in his trio with Jonathan Kreisberg on guitar and Jamire Williams on drums at Bennetts Lane late on Friday. I love the Hammond B3 and Smith was enjoying every moment of his time on Tim Neal‘s beautiful instrument. This was a therapeutic experience and just what the Doctor ordered for me. Kreisberg’s playing was exciting and intense, and the organ was just a thrill and a joy to hear. The notes from a Hammond can be felt deep in the body and seem to free the spirit. I’ll be hanging out for Smith’s new album, Healer, due in a few weeks. But an album is not the same as being there and feeling the B3 vibrations at close quarters. OK, I’m waxing too lyrical. On the second Saturday of the festival I made it to four gigs. Peter Knight and his ensemble’s Fish Boast of Fishing at the Salon, MRC, took me out of my comfort zone and into an emerging, growing, developing experience in which I felt there was a contradiction of sorts. There was definitely tension. There was complexity and coordination in the way sounds were produced, but when I closed my eyes the experience was of something organic, almost living and breathing. Perhaps that was the point. Next came another real highlight for me and I would have missed it if I had not had a recommendation from ABC presenter Jessica Nicholas. The Norwegian outfit Motif was a standout. I always think European bands can be counted on to bring something significantly different to their music and Motif was no exception. This was intelligent, quirky and engrossing jazz, with extreme variations in dynamics and pretty well anything you could imagine. There was ferocity and solemnity. There was pandemonium and space. What a hoot! This was the night’s highlight. There was another great set to follow I’m sure. It was hard to leave. But Tarbaby at the Comedy Theatre — with Oliver Lake on alto sax, Eric Revis on bass, Orrin Evans on piano and Nasheet Waits on drums — served up a set of take-no-prisoners hard-driving jazz. This was a top rhythm section that took me full circle back to the Bernie McGann concert at the festival’s start. Apart from Lake’s robust playing, what I loved most was Evans’s command of the piano in Paul Motian‘s Abacus. This set would have topped the night for me, but I still had Motif ringing in my consciousness and I wasn’t letting that go in a hurry. I did queue up for a long, cold wait to hear some of the Robert Glasper Experiment, but it was too hi-tech for me. I just wanted to chill and listen to Glasper on piano, but the crowd at Bennetts Lane was all fired up. They probably had a highlight at this outing, but not me. On Sunday, the final night, I caught the first set of Sandy Evans with Toby Hall and Lloyd Swanton. It was the perfect wind-down. All in all, there was plenty to get excited about in the MIJF 2012. The crowds were out listening to live music and many venues seemed to be full. Next year? Well, maybe a few more European bands and a little more experimentation. But, after all, there is the Melbourne Jazz Fringe Festival for that. The hubbub on level 24 of The Langham in Melbourne gave way to attentive silence yesterday evening as Murphy’s Law treated the assembled multitude to about four minutes of Big Creatures & Little Creatures: The Modular Suite. The music was a welcome relief from the necessary formalities of the official launch of this year’s Melbourne International Jazz Festival, which will run from June 1 to June 10. If the fragment of this commissioned work by Tamara Murphy was any indication, its full performance at Bennetts Lane as part of the festival’s Club Sessions will be compelling. And if the question on everybody’s lips as program details emerged was how the festival’s focus under artistic director Michael Tortoni would differ from its direction under Sophie Brous, the real story of the night was about a key sponsorship. As Melbourne’s music glitterati watched a promotional video about the delights of the Middle East state of Qatar, it was dawning on us all what a coup it was to bag Qatar Airways as a festival sponsor. The benefit is obvious — it will be much cheaper to fly in international artists, thus countering to some extent the isolation of Australia from the jazz hotspots of the United States and Europe. So who are the big names and what is the flavour of this festival? 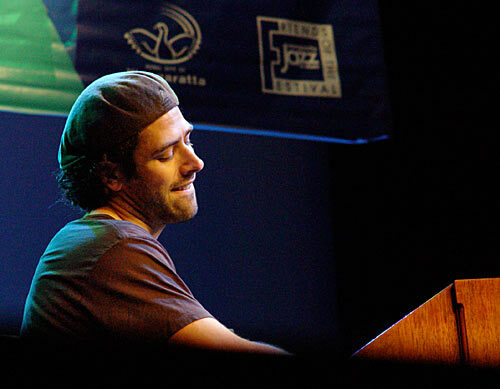 Tortoni described the focus as “jazz royalty alongside the voice of a rising generation” and said MIJF 2012 was “all about what jazz is when the talking stops and the music starts”. Well, every festival has to have its catchphrases, but to take up his theme with another well-worn phrase, the proof of the pudding is in the eating. An initial glance at the program shows it is not overly adventurous, and represents less of a challenge — or an enticement — to audience groups on the fringes of more straight ahead jazz. The very popular multi-stage day of music madness and mayhem at Melbourne Town Hall will not take place this year, due to an absence of sponsorship and most likely of Sophie Brous. That’s a pity, because that gave the recent festivals a welcome edge that it must now fall to the Melbourne Jazz Fringe Festival to fill. 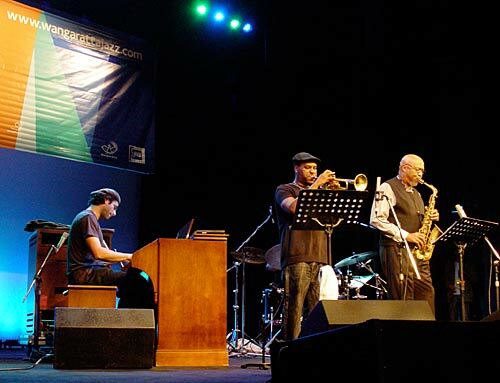 The main international artists include pianist McCoy Tyner revisiting the 1963 John Coltrane and Johnny Hartman album, this time with vocalist Jose James and saxophonist Chris Potter. Potter will also perform some of his own material with Sydney’s Jazzgroove Mothership Orchestra as well as some commissioned Australian material. This should be exciting. James will also feature in the Robert Glasper Experiment, “an Australian premiere event that smashes stylistic boundaries to reshape the future directions of jazz” by “taking hip-hop, R&B, soul and post-modern jazz to never-before-seen places”. For lovers of Billie Holiday and Sarah Vaughan, US vocalist Dee Dee Bridgewater will visit Melbourne for the first time, and also from the ‘States’, Patti Austin will perform a tribute to Ella Fitzgerald with one matinee and one evening performance. The familiar vocal extravaganza at the Palais this year is entitled “The Way You Look Tonight” featuring Katie Noonan, Vince Jones and Kristin Berardi in an opening night gala. Likely to attract a much younger audience will be keyboardist-composer Hiromi (Japan/USA) who blends jazz with progressive rock and classical styles. Her first concert will open with US bassist Robert Hurst joining locals Jamie Oehlers and Dave Beck. Hiromi’s second gig will be a double bill with the Israeli Eli Degibri Quartet, featuring 16-year-old prodigy Gadi Lehavi on piano. A film-themed package will feature five-time Grammy Award winner and cinematic composer Terence Blanchard on trumpet (in a quartet with Brice Winston on tenor, Fabian Almazan on piano and Kendrick Scott on drums), Australia’s Joe Chindamo performing his arrangements of Coen Brothers film music and an ACMI Jazz on Film program. The Salon at MRC will host three concerts with Monash University under the Jazz Futures banner featuring the Terence Blanchard Quintet, The Fringe (with George Garzone on sax) and Tarbaby (with Oliver Lake on alto sax). The Fringe and Tarbaby will also perform at a new venue for this festival, the Comedy Theatre. These outings should keep us awake. From Europe will come bassist Renaud Garcia-Fons, appearing in the Arcoluz Trio at the MRC after a real highlight opener of pianist Luke Howard with Janos Bruneel (Belgium) on bass. Samuel Yirga Quartet from Ethiopia will feature the piano prodigy at the Comedy Theatre, opened by locals The Black Jesus Experience. For lovers of the Hammond B3 (and I’m one), Dr Lonnie Smith (USA) will perform at Bennetts Lane. 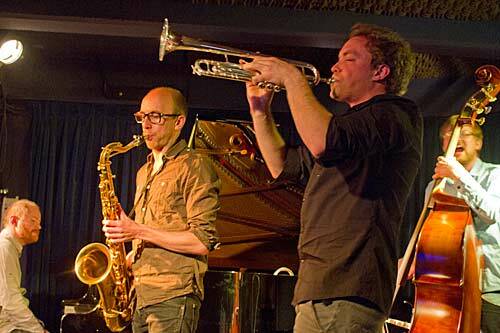 In the Club Sessions, Motif from Norway will feature along with Robert Hurst and the Luca Ciaria Quartet from Italy. Allan Browne Sextet will celebrate the launch of Conjuror — a collection of his jazz poetry — in two sets which should be a festival standout. Sandy Evans will join Lloyd Swanton and Toby Hall for a special closing night celebration presented with the Melbourne Jazz Cooperative. 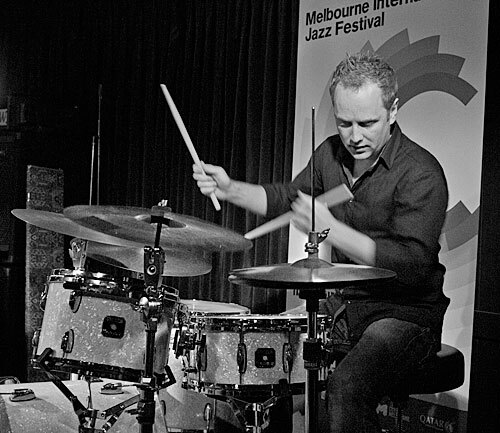 The Melbourne International Jazz Festival opens on June 1. GERRY Koster of ABC radio’s Jazz Up Late was our smooth host for the first concert by an overseas ensemble, easing the expectant audience into a live broadcast. There were three concerts by this quartet during the festival, as well as a solo set by Oliver Lake — featuring poetry — in Holy Trinity Cathedral. I heard the quartet on Friday and Saturday nights, but not the solo gig and not the quartet’s Sunday outing. Saturday seemed to really heat up, and I enjoyed that more. I’ll comment briefly on individual pieces, but in general I found these concerts a display of virtuosity — amazingly skilled players who seemed to do it so easily. My reservation was that, while I marveled at the technique on show, I was not often moved. Pianist Marc Hannaford may argue that the emotion or affect experienced in a performance is in the ear of the beholder, so therefore my reaction says more about me as observer than about the artists’ work. That may be true, but I do like to be moved. I prefer to be affected rather than merely to admire. And this outing often seemed to be more about dynamics rather than melody, harmony or emotion. Another feature was that the quartet did not often depart from the traditional — and a bit boring — structure of solo after solo after solo. Enough preamble. Makin’ It (Lake) was a dry piece with little melody. Gunn must have great chops, as shown in his searing, shining, blaring notes. There was plenty of smash and bash from Beck. In Aztec (Lake) volleys of serrated sound emerged from the alto before the horns built a tangible sculpture, with Lake “smacking his lips” on sax to Gunn’s horn salvos. The piece gradually changed and developed, as if life was being drawn away, its loss being reluctantly resisted in a struggle to survive. I was expecting to hear more from the organ, given the power of the B3, but it did not often assert itself in this concert. In Lake’s early solo of Move Groove he embarked on long, twisting, convoluted runs of notes that he elongated and smoothed out just before handing over to Gunn for a fiery, forceful burst driven from behind by Beck. Gold’s solo seemed unnecessarily restrained, but eventually built momentum to catch and run with the rhythm into the finale of the piece. 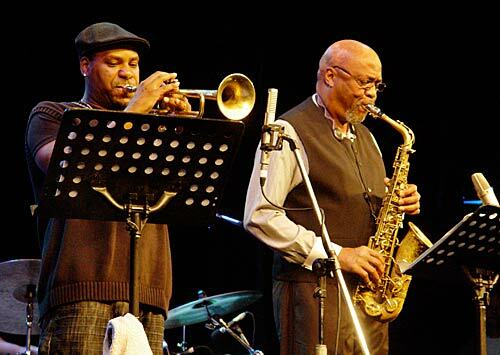 In Walked John, by trumpeter Malachi Thompson in dedication to John Coltrane, was swinging from the word go. Gunn let out a cry of enthusiasm before sending notes soaring, backed by organ bursts, but again the B3 under Gold seemed muted rather than incisive. Lake’s solo was virtuosic and strong. The organ did fire up a bit before Beck went beserk, setting off a duel with Gunn that eventually involved Lake. It really was swinging in the end. The organ was punchier in Yo Dance, which opened with some nice horn harmonies. Lake did some screeching and scratching with the alto, Gunn did some muttering on trumpet and some notes from the horns almost hurt the ears they were so piercing. This was quite out-there stuff — a marvellous melee. Lake’s alto seemed to be alive in that wonderful way saxophonists have of being barely able to contain their instrument, his body shaking and shimmying. At last there was some deep organ input, then the B3 sounded like a flock of nasty seagulls fighting over fish and chip wrappings. The organ shimmered delightfully before the horns joined in dissonant unison and proceedings closed like a barely audible breath. Great stuff. Fire Waltz brought more virtuosity, as Lake effortlessly negotiated complex arpeggios and then the drum-backed organ built speed and intricacy. Gunn wanted in, but Lake motioned for him to wait so that Beck could blast away. The finish was frenetic as Lake displayed finesse and dexterity. The closing piece, I Want to Walk With Jesus, began with soulful sax over glowingly full organ. This was slower, simpler and had much more expression. Things hotted up once Gunn entered the scene and the horns seemed to be aiming for the rafters of the new performing arts centre. There are no star ratings here, but my picks were Yo Dance and the closing number. And there is no doubting the consummate skill of these musicians.